Giving up is the easiest thing to do and the most painful in the long run. Even if you give up on love, it never gives up on you. Life has a lot to offer, giving up is not one of them. 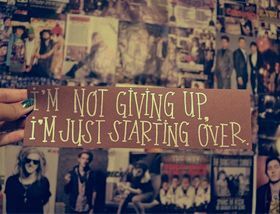 Giving up isn't always the bad thing it's made out to be. Sometimes when you stop putting your energy into something, you free yourself to focus more deeply on something else. If you want to quit, think about why you started in the first place. Giving up is implies halting your efforts to improve your current situation. Giving up is an act of cowardice and people who give up on their efforts are the ones who are not at all positive about their hard work. One should have faith in their hard work and refrain from the cowardly act of giving up. Often the goal is nearer than it seems to a faint and faltering man. So, one should fight any battle valiantly and not surrender under any circumstances. One is bound to face many hurdles and obstacles in our journey towards success. Winners never quit and quitters never win. Giving up is no solution. Giving up is an irresponsible way of dealing with challenges and quitting when the going gets tough. When the going gets tough, the tough ought to get going. People who are pessimistic and do not have the courage to work hard and easily get defeated by adverse circumstances are the ones who eventually give up.